Presidential candidate Bernie Sanders has unveiled a comprehensive racial justice agenda aimed at “addressing the four central types of violence waged against black and brown Americans: physical, political, legal and economic.” The agenda includes, among other policy proposals, a call for police demilitarization, community policing, aggressive prosecution of police officers who break the law, the re-enfranchisement of those with criminal records, banning for-profit prisons, eliminating mandatory minimum sentences, automatic voter registration, making Election Day a national holiday, youth employment programs, free college, and pay equity legislation. Sanders also has an excellent record on racial justice issues, much better than any other candidate running for president. In the 1960s, while a young Hillary Clinton was supporting Republican presidential candidate Barry Goldwater – an outspoken opponent of civil rights legislation – in his quest for the presidency, Sanders was leading protests against police brutality and segregated schools and housing, marching in the March on Washington, and working as an officer for the Congress of Racial Equality. His voting record while in Congress, first as a Representative (1990-2005) and then as a Senator (2006-Present), has earned him consistently excellent marks from the National Association for the Advancement of Colored People (NAACP). The NAACP has given Sanders 100% ratings on its Legislative Report Cards for the entirety of his time in the Senate and near-100% or 100% ratings during his time in the House for, among many other things, voting in favor of strengthening the Voting Rights Act, anti-discrimination laws, and hate crimes legislation and against the death penalty, stringent sentencing guidelines for those caught up in the criminal justice system, and the welfare reform law of 1996 (the only blip on his record is gun control, an issue on which he admittedly has a mixed voting history, though his stance on the issue is much more sensible than many of his detractors contend). 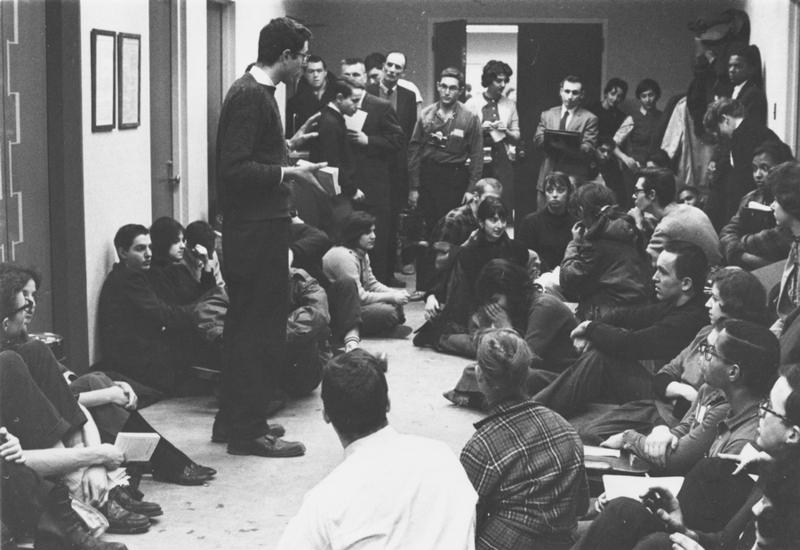 In the 1960s, a 20-year-old Bernie Sanders helps organize a protest of housing segregation in properties owned by the University of Chicago (via https://berniesanders.com/timeline/1960s/). Because of that excellent record, a number of Sanders supporters have been upset by Black Lives Matter protests targeting Sanders. Sanders supporters’ frustration seems to be borne out of two observations. First, Sanders’ passion for economic justice – raising the minimum wage to $15 an hour, breaking up the big banks, making our tax system more progressive, advancing single-payer health care – is intimately connected with a passion for racial justice. Income, wealth, and opportunity inequality in this country disproportionately affect communities of color, and a commitment to addressing them is in many ways in and of itself indicative of a view that Black Lives Matter. Second, and relatedly, Sanders has received a disproportionate amount of attention from protesters relative to Hillary Clinton and Republican candidates, who have almost-uniformly worse records and stances (the one exception may be Clinton on gun control) on issues affecting Black Americans (in fact, Sanders has what is by far the best record of any prominent candidate on civil and human rights across the board; he has long been a strong ally on issues affecting Latinos, the LGBT community, women, and poor people around the world). Sanders supporters wonder why Black Lives Matter is applying pressure primarily to the candidate most sympathetic to their cause. Fighting economic inequality is insufficient — any challenge to capital has to be coupled with race-specific demands for reform. Jobs programs would have to include affirmative-action policies and a prohibition on discrimination on the basis of a criminal record; fights to expand funding for public hospitals, schools, and services would have to recognize the specific needs of black communities hollowed out by decades of deindustrialization and neglect; and housing policies would need to explicitly target practices such as redlining and predatory lending. This fight will require forging a unity not by collapsing the fight against racism into a broader class fight for economic equality, but by highlighting the central role of racism and making it a concern of the entire working class. Black Lives Matter protesters wanted Sanders’ campaign to stop treating racial justice as an inevitable byproduct of economic justice. They wanted Sanders to instead promote a specific racial justice platform complementary to his economic justice agenda, and they had every right to demand that he do so. This constituency is demanding to have the issues of structural racism and police violence taken up within the political system…They’re forcing Sanders and other candidates to respond on an issue that it seems like they would have preferred to avoid. If Sanders responds by joining in their fight, they’ve pushed the Movement for Black Lives into the presidential debate and into the mainstream of [American] progressive politics—from which they currently and justifiably feel left out. This is fair game, and an approach that fans of Bernie Sanders should understand…For people who simply wanted to hear the candidates answer questions and present their stump speeches, there are plenty of opportunities for candidates to share positions on the issues—at least on the ones they’re not ducking…The Black Lives Matter agenda is not the only issue of moral urgency, but it most certainly is one of them. All progressives should applaud activists who took the opportunity to push it forward. So we have two groups to thank for Sanders’ ambitious racial justice platform. Sanders and his campaign staff absolutely deserve credit for unleashing it and for being allies in the movement. Black Lives Matter deserves the bulk of the credit, however, not just for pushing the conversation on this issue forward, but also for reminding us that even the best presidential candidate won’t be able to enact the change we need without a constructively critical social movement behind him. As the historical record shows, we cannot assume that reductions in the overall level of inequality will trickle down to African Americans. In the golden age of postwar American capitalism, an era to which many left-liberals yearn to return, economic inequality was much lower than it is today, but there was no corresponding decrease in racial inequality. If anything, it was even starker — in 1959, more than half of black families lived in poverty, while 15 percent of white families did. While it is certainly true that a strong economy on its own has never come close to eliminating racial disparities in economic outcomes, the wording in this paragraph implies that outcomes for Black Americans did not improve during “the golden age of postwar American capitalism,” an implication which is incorrect (big thanks to Dean Baker for pointing out this issue). In fact, a growing body of evidence shows that a strong economy is especially important for Black workers.